As gluten-free diets have become more common, almond meal has taken its place in the baking needs aisle of the grocery store. As convenient as that is, making your own almond meal is simple to prepare, requires only three things (almonds, a coffee bean grinder, and a flour sifter), and takes less than 5 minutes. The best part is that you will have fresh almond meal at a fraction of the cost of store-bought. Almond meal is not only a delicious substitute for flour in gluten-free baked goods but also adds a nice flavor when swapped out for breadcrumbs in savory recipes. For the Jewish holiday of Passover, the nut flour is often used to replace flour in cakes, cookies, and other desserts since flour is a forbidden ingredient during the week-long observation. Place almonds in a clean electric coffee bean grinder. Secure the lid and pulse several times until a medium-fine textured meal forms (similar to cornmeal). Make sure not to over-grind or it will turn into almond butter. Place the ground almond meal in a clean flour sifter. Sift the almond meal into a bowl; place any large particles of almonds back in the coffee bean grinder and pulse again. Sift the remaining almond meal. Pour into a storage container and either use immediately or refrigerate or freeze. Because it can become rancid after being ground and exposed to oxygen and light, either refrigerate the almond meal, or for longer storage, wrap, label, and freeze. If you are making the almond meal for a gluten-free recipe, make sure the sifter is thoroughly cleaned and free of any gluten cross-contamination. If you find yourself making nut meal often, it is best to have a "dedicated" gluten-free sifter on hand. If you don’t have a coffee grinder, you can use a food processor. However, you may want to freeze the nuts first before grinding since there is a greater chance of the almonds turning into nut butter in the processor (the cold temperature will slow this down). 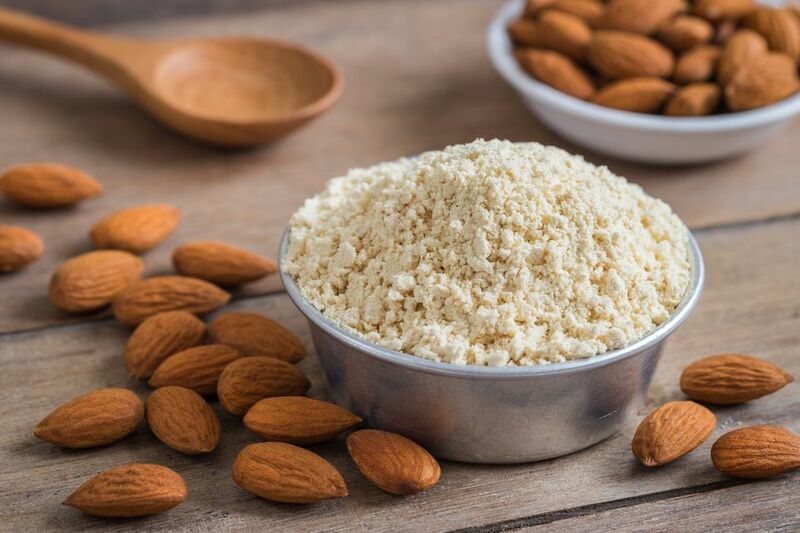 Store-bought almond meal is frequently made with blanched almonds, which are almonds that have had the skins removed, but you can use almonds that still have their skins when making your own almond meal. Actually, almond skin contains healthy antioxidants, so using almonds with the skin adds a nutritional benefit to your nut meal. You can use this technique with almost any nut. Try walnuts, cashews, or pecans; hazelnuts are also wonderful when ground and used in baked goods as well as savory dishes. Once you make your own almond meal and begin using it in recipes, you will see how versatile it is. Use this almond meal to make delicious gluten-free baked goods, such as chocolate macarons or soft-baked almond flour chocolate chip cookies, or coconut almond shortbread. Almond meal is also one of the main ingredients in torta alle mandorle e limoni, a flourless Italian almond-lemon cake. But almond meal is not just a flour substitute; it will also add amazing flavor to a summery fruit dessert, such as peach crumble, as part of the sweet topping. Uses for this almond meal aren't limited to just baked goods. Almond meal can create a delicious crust for chicken, fish, or shrimp, and is wonderful sprinkled on top of casseroles in place of breadcrumbs. It can add a nice crunch and flavor as a salad topping and in stir-fries as well. This nut meal can also be found on ingredient lists for savory dishes, such as the Indian chicken dish badami murgh korma, where it is part of a flavorful gravy that the chicken is cooked in. Although they can usually be used interchangeably, nut meal and nut flour are two different ingredients. While nut meal is simply made by grinding up the nuts, nut flour is created by a more complex process. First, the oil is pressed from the nuts, leaving a cake; that cake is then ground up into a fine consistency, similar to flour.